AMSTERDAM (AP) — The International Criminal Court installed Gambian war crimes lawyer Fatou Bensouda as its new prosecutor for a nine-year term on Friday. Bensounda replaces Luis Moreno-Ocampo in a job that has become one of the most prominent in international law over the past decade. She will be tasked with trying to bring to justice alleged war criminals, including Uganda’s Joseph Kony, Libya’s Seif al-Islam Gadhafi, and Sudanese President Omar al-Bashir. 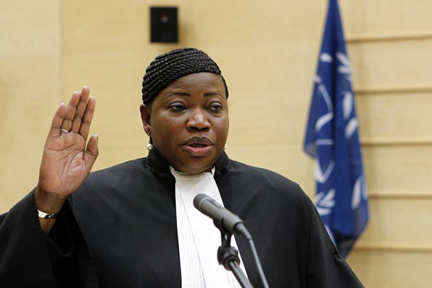 In an address to the court, Bensouda said she was “humbled” by her appointment and promised to continue pursuing all cases that fall under the court's jurisdiction. “As I speak, massive crimes continue to be committed in Darfur (Sudan); Joseph Kony and the Lord's Resistance Army’s acts of violence continue unabated in central Africa,”she said. Court President Sang-Hyun Song oversaw Bensouda’s acceptance of the prosecutor’s duties in a courtroom in a suburb of the Hague, Netherlands. “First of all, let me say that yes, I am an African and I am very proud of that,” she said. “But I am a prosecutor for 121 states parties,” she said, referring to all the countries that endorse the court. She said she would investigate any grave crime in any territory that falls under her jurisdiction, and the international court is bound to be criticized both when it intervenes in a conflict and when it doesn’t. When the court intervenes, as it did in indicting Sudan’s al-Bashir and Ivory Coast’s former President Laurence Gbagbo, it is accused of selective enforcement. But she said prosecutors must act on the basis of the evidence they have. Asked whether she would lobby for countries that don’t endorse the court, such as the U.S., to join it, she said that would be outside the scope of her job. She said she was frustrated by the failure to capture Kony, who was indicted in 2005 . His case became broadly known in the U.S. earlier this year after the “Kony2012” video campaign by a human rights group became an Internet sensation. But “Joseph Kony, even though we have not been able to arrest him all this while, I think the intervention of the ICC has contributed immensely to bringing peace to Northern Uganda,” she said. Moreno-Ocampo, who was present Friday for Bensouda’s swearing-in, is expected to take a job with FIFA, the international football (soccer) governing body, investigating corruption in the sport.